The owner of a non-governmental organisation, Dignity for the Helpless Foundation (DHF), Pastor Samuel Brown, has disclosed that the mother of Tochi, a kidney failure patient, Ndidi Mbonu, is using her daughter to make money. Pastor Brown, in a 12-page document, explained that his organisation had already given the family about N3.9m as against the N1.4m Ndidi said she collected. He said the NGO later realised that the family, while getting money from the group, was also raising money through some other platforms. The Punch had reported that Tochi, a graduate of the Benue State University, became deaf in India after being on dialysis for two years in the country. She was on dialysis in Nigeria for one year before being flown out in 2015. Her mother, Ndidi, said she was stranded with her daughter in India due to lack of funds for her kidney transplant, adding that she had resorted to selling beans cake (moin-moin) for survival. She had said her family was introduced to Brown’s NGO in 2015 and an agreement was reached to raise N11m for Tochi’s operation. She explained that Brown also agreed to open a joint account with the family to ensure transparency and accountability. Tochi’s mother said she was surprised when the NGO opened an account without involving any member of the family. Ndidi said Brown had only given them N1.4m, adding that he paid N30,000 every two weeks to reach the sum about a year ago. Tochi, who chatted with Punch on WhatsApp, had begged for help from Nigerians, saying her condition was becoming critical. The NGO, however, said Ndidi was blackmailing the organisation after she had threatened to deal with the owner if she didn’t get N6m. Brown said during the first meeting between the NGO and the family in September 2015, the widow said the family needed about N4m for regular dialysis and treatment of her daughter. Ndidi was alleged to have authorised the organisation to raise funds with the girl’s name in October 2015, just as DHF increased the target to N6m to enable the victim to be on dialysis for at least one year. In October 14, 2015, it was reportedly agreed that Tochi, Brown and the group’s manager, Shallom Ufforth, would be co-signatories to the account. Brown said the group placed adverts and ran stories in media houses to start the campaign. He said Ndidi later called to inform them that the family had decided to move Tochi to India for a kidney transplant, adding that she demanded that N6m be raised for the operation. “Right there in the office, we started discussing our experiences concerning the matter. 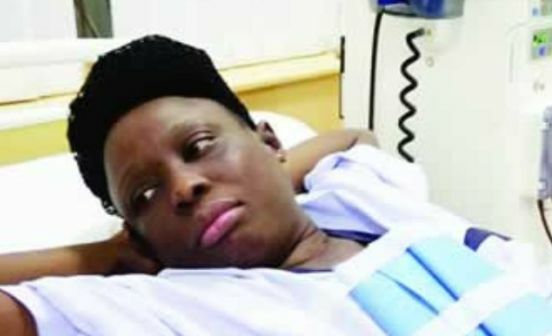 Since she was spending N27,100 per session for dialysis in the hospital, that means if we want to go by doctor’s advice, three times a week will be N81,300. That was how we raised the amount to N11.5m. The hospital documents in her hands and our inquiries suggested that some people may go through dialysis for two to three years before the transplant is carried out,” Brown added. He said the group had paid Ndidi about N2m, which were not documented, adding that sometime in January 2016, based on her instruction, the NGO sent N50,000 and N200,000 to the account of one Oluwafemi Bukola. Brown said sometime in June 2016, Tochi’s mother started making unfounded claims about the amount raised by his organisation with a threat to blackmail him if she didn’t get N6m. “I called her on September 11, 2016, and asked her to check her record; that only that year alone, she had collected N1,150,000. She said, ‘Are you not making money too?’ This was when it dawned on me that this woman was up to something. “When I asked her if she recalled that she had collected N2m from us before the N1,150,000, she said she thanked God that the money was not paid into her account and that she would deny it. “At some point, we started begging her that we wanted to use her Indian line to campaign so that when people called, she would give them situation reports. She said she would deny that she was aware of the campaign if anyone should call her. She said she would be happy with us if we give her N6m cash,” Brown added. He noted that the NGO later learnt that Ndidi had earlier raised N10m through two media houses before she approached them, adding that he was disappointed that the family never mentioned that to them. Brown said while he was planning another round of campaign to raise funds, he saw a publication on Tochi’s condition and her mother’s allegations against the group. He said, “This woman has collected money from us to the tune of N2m without record. We told her that she should have told us that she had already gone far with the media (in raising funds); if we knew, we would not have involved ourselves. He said with payment for adverts, the organisation had spent a total of N4,727,611, adding that he had yet to raise up to N5m.